All transactions are safe and secure with a reliable history in online purchasing behind each of our associates. Buy the House M.D. Books - Medical Science Book, House and Philosophy to own House clothing and merchandise. Delve into the hit medical drama with these House, M.D. books. 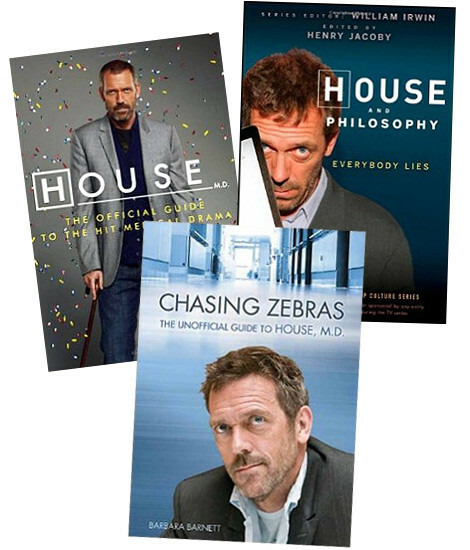 Start with author Henry Jacoby's bestseller House and Philosophy: Everybody Lies, which explores the philosophical issues that arise on the TV show. If you're more interested in the medical side of the drama, then pick up Andrew Holtz's two books that explore the fact and fiction behind the medical science seen on the show. For lighter fare, try the official guide to the TV series that includes a foreword by actor Hugh Laurie. In addition to the House M.D. Books - Medical Science Book, House and Philosophy above, browse the House Clothing Gallery for more apparel like men's and women's clothes, kids shirts or hoodies.